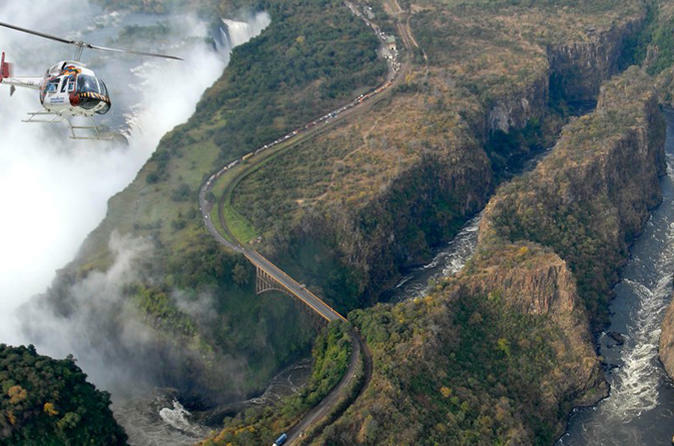 Take in the incredible views of one of Africa’s natural wonders during this Victoria Falls helicopter tour. You’ll spend 13 minutes flying high above one of the world’s largest waterfalls in a 10-seat, glass-sided helicopter. This once-in-a-lifetime flight gets you up close to the falls and the 360-foot (108-meter) gorge that divides Zamabia from Zimbawe. You’ll leave with a lifetime of memories and a video and photo to commemorate this experience. Your Victoria Falls helicopter tour kicks off with pick up from minibus pickup from your Victoria Falls hotel. You’ll head out to a local helipad where you’ll receive a safety briefing before taking off in a glass-sided, 10-seater helicopter for this incredible African experience. You’ll get a bird’s eye view of the notorious Zambezi River, vast gorges that divide Zambia from Zimbabwe, and of course, the stunning Victoria Falls—one of the Seven Natural Wonders of the World. Not only is this one of the largest waterfalls on the planet—it’s also one of the most spectacular. Your expert pilot will take you on a figure-eight loop over the falls to insure picture-perfect views for all. Since the helicopter boasts glass sides, even passengers without a window seat are guaranteed unobstructed views. After 13-minutes touring the skies you’ll head back to the helipad where your friendly pilot will present you with a video and photos of this once-in-a-lifetime experience. Due to comfort and weight / balance of the aircraft, passengers weighing over 265 pounds (120kg) will be required to purchase an additional seat. This is payable directly to the tour operator on the day of the tour.